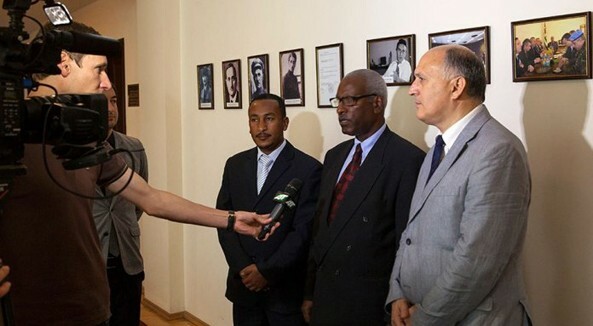 ON JUNE 10 in the Ministry Foreign Affairs of Abkhazia was held a meeting of the Foreign Minister Viacheslav Chirikba with the delegation of the State of Eritrea comprising of the Ambassador Extraordinary and Plenipotentiary of the State of Eritrea in the Russian Federation Teklay Minassie Asgedom and Head of the Department of Asia and the Pacific of the Ministry of Foreign Affairs of the State of Eritrea Kalekristos Zariseney Gebreyezus. According to Viacheslav Chirikba the Minister of Foreign Affairs of Eritrea is going to visit Abkhazia soon. “It happened that the Foreign Minister had to attend the inauguration ceremony of the President of Egypt and could not visit Abkhazia. But from myself and representative of the MFA of Eritrea I would like to confirm his intentions to come on an official visit to Abkhazia. I also want to convey, on behalf of the Minister of Foreign Affairs of Eritrea the invitation to the Abkhaz Foreign Minister to visit our country at any time” – said Teklay Asgedom. “This is a familiarization visit and we have very good impressions about Abkhazia, we were able to understand many aspects of life in this state. Of course, our visit will help to reach a final political decision“, – he emphasized in an interview. At the meeting were also discussed a number of questions about the prospects for economic, educational, humanitarian and political engagement. 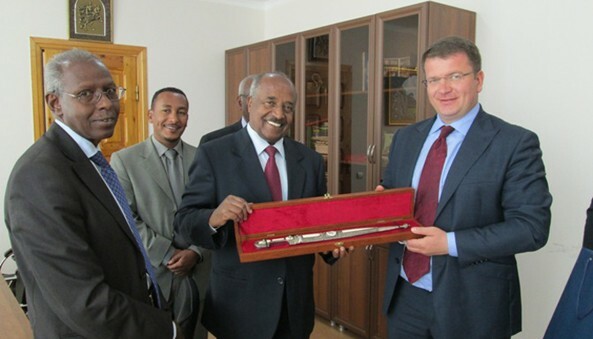 (Asmara, 06 June 2014) – A high-level Eritrean delegation headed by Foreign Minister Osman Saleh and including Mr. Yemane Gebreab, Head of Political Affairs at the PFDJ, is conducting visit in the Republic of Crimea. In a meeting it held with Vladmir Konstantonov, Chairperson of the Crimean Parliament, the high-level delegation indicated that the visit is aimed at taking observations regarding developments in the country it has been following through the media. The high-level delegation is taking part in a festival marking the 215th anniversary of Alexander Pushkin’s birthday. Meanwhile, the high-level Eritrean delegation is due to visit the historical port city of Sevastopol which is located along the Black Sea and hold discussion with the Mayor of the city, besides participating in the official ceremony in connection with Pushkin’s birthday at Yalta city where the Chairman of the Russian Assembly and various other officials will be present. It is to be recalled that the Eritrean delegation earlier visited South Ossetia and held talks with the President and Prime Minister of the country. MINISTRY of Foreign Affairs expresses its strong protest to Eritrean side over not approved by Ukraine visit on June 5-6, 2014 of Minister for Foreign Affairs of the State of Eritrea Osman Saleh Mohammed to the temporarily occupied by the Russian Federation the Autonomous Republic of Crim (Crimea). Ukraine considers that visit as an unfriendly step, blatant disregard of international law by Eritrean side as well as a flagrant violation of Ukrainian sovereignty and domestic law, of the UN Charter and the UN General Assembly resolution “Territorial integrity of Ukraine” adopted on March 27, 2014, that may have deeply negative effect on further development of Ukrainian – Eritrean relations. We call on the Eritrean side to respect strictly the territorial integrity and sovereignty of Ukraine and to comply with the international law.